Camo Hunting Shirt L Weight. Lightweight Camo Button Up Shirt (unlined) If you are a hunter who likes lightweight unlined button up shirts for the hot, humid early season, or just want something other than a T-shirt, then here’s the solution – X Scent’s Lightweight Camo Button Up Shirt. This shirt is made from the latest development in performance moisture management and heat wicking fabric – XF058. XF058 is an X Scent exclusive polyester fabric with 5 percent X-STATIC that wears extremely light on the skin for unmatched comfort. Notable: No reactivation or regeneration required. Fabric: 40 percent cotton, 55 percent twill, 5 percent X-STATIC. Camo Hunting Shirt M Weight. A Camo button up shirt has a loyal following among certain sportsmen. 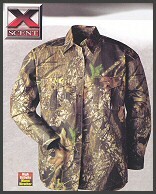 So if you are that hunter, who likes mid-weight button up shirts, then here’s the solution - X Scent’s Mid-Weight Camo Button Up Shirt. Perfect for early to mid weather mid season hunting. Fabric: 40/60 cotton twill outer shell; 95 percent polyester, 5 percent X-STATIC inner liner. 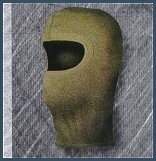 X Scent's Head cover is by far the most technologically advanced in the hunting industry, considering its ability to eliminate the source of odor by preventing bacteria growth, and regulating body temperature by conducting heat away from the body with X STATIC silver fiber technology. 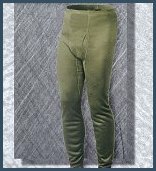 Hunting Base Layer Pant LW. With the Base Layer Pull On Pant (light weight), hunters now can wear their favorite camo pattern during the warm early season with the added benefit of effective scent elimination. X System has taken this basic polyester product and combined it with System , making it a technologically advanced hunting product. Hunting Base Layer Pant MW. With the Base Layer Pull On Pant (mid-weight), hunters now can wear their favorite camo pattern during the warm early season with the added benefit of effective scent elimination. X Scent has taken this basic polyester product and combined it with X STATIC, making it a technologically advanced hunting product. 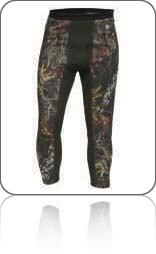 Hunting Base Layer Pant Pro Series. 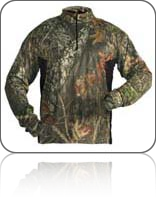 Hunting Base Layer Pullover Pro Series.